BAC skilled craftworkers built many public schools throughout the U.S. Pictured above, the Ashwood School, constructed at Bellevue, Washington in 1955, shows the use of SCR brick for exposed interiors. This not only proved to be economical in construction, but maintenance was reduced to minimum. of oncoming children, as well as for those now housed in overcrowded or worn out buildings.” Fast forward to 2019, our nation’s public school infrastructure continues to age and more than half of public school buildings are in dire need of repair. 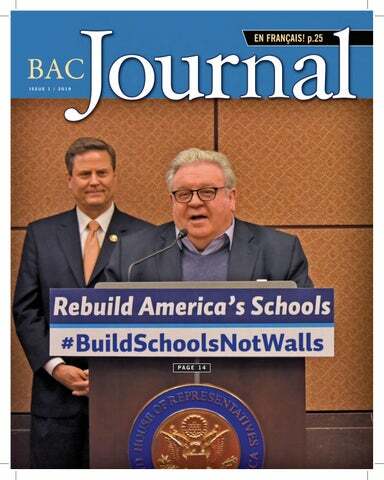 That’s why on January 30th, House Democrats unveiled the Rebuild America’s Schools Act, a plan to invest $100 billion in our nation’s public school system (see page 14). in 2018 that have already reported work hours. That doesn’t include contractors that were already signed in other Local union areas, or contractors that signed project only agreements, or about 20 additional contractors that have yet to report work hours. No, that’s over 80 signatories that are completely new to BAC, that are paying wages and benefits to our members today, and who were brought in through your efforts. Some came in thanks to relentless top-down meetings, while others signed because of grassroots organizing of their craftworkers. Some are small shops that only employ the owner and a helper, while others have aspirations to dominate their market. Some brought in entire crews of new members when they signed, while others needed access to our existing membership. But they all have one important thing in common: every single new contractor that we organize provides new work opportunities to our members and eliminates work opportunities for non-union contractors. And that’s the name of the game. That’s how we build market share, and that’s how we build power on the jobsite and at the negotiating table. Recently, the Pacific Northwest ADC signed LDC Inc., a non-union contractor in Southern Oregon, which as a result added 20 members to the BAC family (page 6). Through the top-down organizing campaign, our Local built up the trust necessary over a course of six months to add the contractor to our team. That’s great news, and I know that there are more stories like this across North America. Now, this is only a start. We need to keep our forward momentum going. If we brought in 80 to 100 contractors in 2018, then we need to do at least as well in 2019. It’s your focus and commitment to growing our Union that gets the job done. Let’s keep up the good work, keep organizing, and show the industry that BAC is here to stay. Administrative District Councils, ADCs) del sindicato de Albañiles y Constructores Aliados (Bricklayers and Allied Craftworkers, BAC) firmaron más de 80 contratistas nuevos en 2018 que ya han reportado horas. Esto no incluye a los contratistas que ya habían firmado en otros sindicatos locales, contratistas que solo firmaron Proyectos de Acuerdo Laboral (Project Labor Agreement, PLA) o acuerdos de un solo empleo, o alrededor de 20 compañías nuevas que aún no han reportado horas. No, estos son más de 80 firmantes que son completamente nuevos en el BAC, que pagan salarios y beneficios a nuestros miembros hoy en día y que trajimos gracias a sus esfuerzos. Algunos vinieron gracias a las reuniones descendientes incansables, mientras que otros firmaron debido a la organización de las bases de sus constructores. Algunas son pequeñas tiendas que solo emplean al dueño y a un ayudante, mientras que otras tienen aspiraciones de dominar su mercado. Algunos trajeron equipos enteros de miembros nuevos cuando firmaron, mientras que otros necesitaron acceso a nuestros miembros existentes. Pero todos ellos tienen algo importante en común: cada contratista nuevo que organizamos proporciona oportunidades de trabajo nuevas para nuestros miembros y elimina las oportunidades de trabajo para los contratistas no sindicalizados. Y ese es el objetivo principal. Así es como aumentamos la participación en el mercado y como construimos el poder en el lugar de trabajo y en la mesa de negociación. Recientemente, el ADC del Noroeste del Pacífico firmó con LDC Inc., un contratista no sindicalizado en el sur de Oregón, lo que dio como resultado la incorporación de 20 miembros a la familia del BAC (consultar página 6). A través de la campaña de organización descendiente, nuestro Consejo Local construyó la confianza necesaria en un período de seis meses para agregar al contratista a nuestro equipo. Ahora, esto es sólo un comienzo. Necesitamos mantener nuestro impulso hacia adelante. Si trajimos 80 o 100 contratistas en 2018, tenemos que hacerlo al menos igual de bien en 2019. Es su enfoque y compromiso para hacer crecer nuestra Unión lo que hace el trabajo. Sigamos con el buen trabajo, sigamos organizando y demostremos a la industria que el BAC está aquí para quedarse. IU Regional Director, Canada 2100 Thurston Drive, #3 Ottawa, ON K1G 4K8 (613) 830-0333 Editorial Staff: Brian Kennedy, Yin Yin The BAC Journal (ISSN 0362-3696) is published quarterly for $1.50 per year in advance, postage paid, for the U.S. and Canada ($1.75 per year in all foreign countries belonging to the Postal Union) by the International Union of Bricklayers and Allied Craftworkers. Periodicals class postage paid Washington, DC, and additional mailing offices. 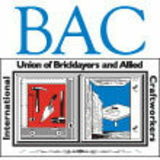 Postmaster: Send address changes to the BAC Journal, International Union of Bricklayers and Allied Craftworkers, 620 F Street, NW Washington, DC 20004. Canadian Postmaster: Send address changes to PO Box 503, RPO West Beaver Creek, Richmond Hill, ON L4B 4R6 Published for Bricklayers, Stone Masons, Plasterers, Tile Layers, Marble Masons, Cement Masons, Mosaic and Terrazzo Workers, Finishers, Pointers, Cleaners, and Caulkers. New Problem-solving Strategies Rooted in Timeless World Craftsmanship EDITOR’S NOTE: Originally written by Leslie Dyson and published on TradeTalk (Spring 2019 issue), this article is reprinted in this BAC Journal with permission, featuring BAC Local 2 British Columbia tilesetters’ quality work in downtown Vancouver. BAC Local 2 BC 30-year member Dan Corra leveling the floors for the screed. Paulo Perozzo, a 30-year member of BAC Local 2 BC, setting the perimeter on the jobsite. four days a week to mud the entire area and install all the stonework. Every job comes with new problems to solve and a growing skill set. “Yeah,” he said, “there are some guys who learn for a year and then put a sticker on the side of their van and say they can do it all. I don’t get it.” Constant learning and working for a great company keep Nikolic enthusiastic about the work. As you’d expect Perozzo and Corra’s houses are showcases for their skills. Corra’s 1930s house has been renovated to include half-inch brick veneer around some windows, a quartz counter top, multicolor slate flooring in the basement and a bathroom with 1x1 octagon marble tile, 3 x 6 subway tile in a brick pattern, a marble border and a glass mosaic. “I have tile, porcelain, granite and stonework in my house,” said Perozzo. “I did everything myself. Not very many know how to do this stuff.” BAC Local 2 BC, like many Building Trades Locals, is “facing the effects of a lack of appreciation for quality work, outsourced materials and the under-ground economy,” said BAC Local 2 BC president Geoff Higginson. The Union represents bricklayers, stone masons, tilesetters and terrazzo workers. There are approximately 350 bricklayer members, 75 tilesetters and several dozen doing stone work and only a few left doing traditional terrazzo. “The scope of work is being eroded,” he said, as he pointed to the flaws in the floor tiles at a popular coffee shop. First place winner of the first-year level Mason Lowell of BAC Local 8 Southeast. AC apprentices took five out of nine top placements at the annual MCAA Masonry Skills Challenge during the MCAA Convention at the World of Concrete/World of Masonry held on January 23rd in Las Vegas, Nevada. A showcase of skills training in the masonry industry, the Masonry Skills Challenge brought together bricklayer apprentices from across the country to compete in three skill levels: first-year level for those just entering the trade; second-year level for more experienced newcomers; and third-year level for those about to enter the workforce as journeylevel craftworkers. Each level is given a project to build appropriate to their craft skills. The projects are a complete surprise which means no contestants are aware of the projects in advance. No contestant is allowed to consult with anyone during competition, including instructors, other competitors, and judges. Awards were presented to the top three apprentices in each skill level after a fierce competition. Firstyear apprentice Mason Lovell of BAC Local 8 Southeast won first place. Joseph Hite of BAC Local 9 Pennsylvania and Mitch Kittinger of BAC Ohio-Kentucky Administrative District Council placed 2nd and 3rd in the second-year level. In the thirdyear level, Tyler Hack of BAC Local 4 Indiana/Kentucky and Jonathan Weininger of BAC Ohio-Kentucky Administrative District Council took first and second places. Joseph Hite of BAC Local 9 PA, left, and Mitch Kittinger of BAC OH-KY ADC, placed 2nd and 3rd places respectively in the second-year level. Third-year apprentices Tyler Hack of BAC Local 4 IN/KY, left, and Jonathan Weininger of OH-KY ADC, placed first and second respectively. Owner of LDC Inc. Scott Bond, left, signs the agreement with BAC Local 1 Oregon President Matt Eleazer at company’s office in Cottage Grove, OR. as a BAC contractor. To bring LDC’s employees on board, LDC’s management and Local 1 OR coordinated meetings with the employees and promoted the Union to them. “When it’s time to deal with the sticky problem of jobs, the company bid based on non-union numbers, but we didn’t want to exclude jobs and lose trust of the employees. Instead, we used market recovery funds to allow those projects to be worked with union wages and benefits, so that all our new BAC members started off on the right foot,” said Brother Eleazer. As a result, twenty employees of LDC were brought into BAC Local 1 OR as new members. They are reporting around 4,000 hours a month and are actively engaged in the Local’s apprenticeship program. The organizing success highlights the importance of persisting in building relationships with contractors. he Union is undertaking a number of organizing initiatives, including Construction Organizing Membership Education Training (COMET). COMET is a focused three-hour educational training programs delivered to rank and file members. Many BAC Locals and ADCs have recently completed COMET programs. The program generates membership support and participation in organizing. Since 2017, BAC members throughout the country are participating in COMET sessions to learn how to be more actively involved in their Local/ADC’s organizing efforts. Our past issues of BAC Journal have featured our members’ participation in COMET. This issue continues highlighting their engagement in this training (see pictures). BAC delegates at a workshop facilited by BAC Local 8 Southeast Glenn Kelly. From left, Bernard Briggs, Russel Smith, Todd Buckner, Winall Longdon, Jonas Elmore, and Angela Henderson. Participants of the IU’s 2019 Local/ADC Administrative Staff Training Conference. From left, Jennifer Jonson of PNW ADC, Cecilia Aguilera of Local 3 CA, NaVonda Thomas of Local 8 Southeast, Johnnie Allen of MW ADC, Teresa Ruiz of Local 4 CA, Jill Sturdevant of Local 2 MI, Heide Rodriguez of Local 4 CA, Linda Podgorski of Local 1 MN/ND/SD, Anita Naprstek of ADC 1 of IL, Kerry Young of Local 15 MO/KS/NE, Becky Gatapia of Local 15 MO/KS/NE, Brittany Riggs of Local 4 IN/KY, Meghan Bittner of Local 1 MN/ND/SD, Heather Karns of Local 3 IA, Danell Gaudieri of Local 3 NY, Shawn Williams of Local 9 PA, Elizabeth Rearson of Local 3 NY, Mary Stanko of Local 9 PA, Leslie Castellanos of Local 1 MD/VA/DC, Diana Rivera, Angi Trumbauer of Local 6 IL, Danette Kualapai of Local 1 HI, Tracie Williams of OH-KY ADC, Carmen Olivo-Garcia of Local 3 CA, and Vanessa Marquez of ADC 1 of IL. sharpen their skills in doing their muchneeded work, the IU launched its first Local/ADC administrative staff meeting last year which was well received by the participants. This year’s meeting offered participants with an overview of functions of many IU programs, a deep dive into Member Portal, a navigation of Construct Connect, and best practices of digital communications tools.  The mobile-responsive design makes the website easy to navigate. T  he new look of the BAC website homepage. •	The addition of featured projects; •	Consolidated FAQs for easyviewing and filtering; •	Filterable list of Locals and Regions with contact information all listed in one place; •	Filterable news and BAC Journal articles; •	New “Support” section for Members, Officers and Contractors; •	Consolidated information behind member login. Each member can create their own login account to access information. From there, you can login to Member Portal with the same username and password; •	New “BAC Tool Sales” section giving members a more convenient shopping experience. The IU welcomes you to its new website bacweb.org. Please contact askbac@bacweb.org if you have any comments or questions. La période de candidatures 2019 pour la bourse d’études Harry C. Bates du Bac est maintenant commencée Le programme canadien de bourse d’études Harry C. Bates est administré par Universités Canada, situé à Ottawa. Trois étudiants seront sélectionnés chaque année. L’étudiant en première place recevra une bourse de 3000 $ (CA); celui en deuxième place, une bourse de 2500 $ (CA); et celui en troisième place, une bourse de 2000 $ (CA), et ce, par année et pour une période allant jusqu’à quatre années consécutives si l’étudiant maintient des résultats scolaires satisfaisants. Pour être admissibles à la bourse d’études canadienne Harry C. Bates 2019, les candidats doivent être le fils ou la fille d’un membre du BAC du Canada qui est membre en règle d’une section locale du BAC du Canada. Ils doivent également en être à leur dernière année du secondaire au cours de l’année scolaire 2018-2019 et avoir l’intention de commencer l’université à l’automne 2019. Pour de plus amples renseignements en français et en anglais au sujet du programme et pour avoir accès au formulaire de candidature, rendez-vous à l’adresse Web suivante : https://portal.scholarshippartners.ca/. Pour commencer une candidature en ligne, veuillez saisir le code d’entreprise suivant : 105HAR2019. La date limite pour la remise des candidatures est le 15 mai 2019. Pour toute question au sujet de la bourse d’études Harry C. Bates, veuillez communiquer avec le service d’éducation du BAC, en composant le numéro sans frais 1 888 880-8222, poste 3887, ou en envoyant un courriel à l’adresse askbac@bacweb.org. time as an instructor at the Atterbury Job Corps Center, where he taught from 2002 to 2008. “You meet somebody that has no concept of the trade…and then you see them grow and develop. They leave, graduate from the program, and go on to be successful in Corps Director. their lives. Above and beyond money, that’s the best feeling. I used to “My grandfather and his sons all dabbled in carpentry, so I tell my students, ‘money will never keep you in a trade. You have to thought, ‘Oh, this would be good for me because I already know absolutely love what you do.’ And I just absolutely love what I do.” how to do some of it,’” said Elmore. But it didn’t take long for Despite his passion for teaching the trade, Elmore was initially him to realize he wasn’t going to follow in his family’s footsteps: reluctant to step into the role of instructor because he loved the carpentry classes left him unengaged and working in the field. “When I graduated from the shop tasks felt monotonous to him. Job Corps, I moved to Indianapolis, Indiana and Elmore grew up on the south side of worked for a brick and stone contractor, BroadyChicago and was raised by a hard-working single Campbell, through my whole apprenticeship mother supporting him and his two sisters. At and career in the field, from 1992 to 2002,” said 19, like most young adults, he was trying to Elmore, who joined BAC Local 4 IN/KY. He figure out what to do with his life when he ran had taken a chance leaving behind his hometown into an old friend from his high school football of Chicago for Indianapolis. Knowing no one team, “He had disappeared from the scene. in the area, he had to quickly figure out how to Nobody knew where he went. I asked where make his own way. Elmore arrived in Indiana by he’d been, and that’s when he told me about Job bus, and within a few weeks, got his first car and Corps – that I could learn a trade and get my apartment. IMI’s National Job Corps Director GED – for free,” said Elmore. That fall, Elmore “I had seen so many other people in my life Jonas Elmore. packed his bags for Golconda, Illinois, and began fail, and from a young age,” said Elmore. It was his journey with Job Corps. the fear of failure that kept him going – something that drives At the suggestion of his roommate, Elmore tried his hand him to this day. at bricklaying, and he was hooked from day one. “I’m just glad Elmore’s drive for success was apparent. At Broady Campbell, the instructor took a chance on me, because he wasn’t taking he eventually started running jobs. “I got all around training [on any students,” said Elmore, noting that the class was technically the job]. You couldn’t ask to work for a better contractor,” he full when he enrolled. “I just fell in love with the trade,” he said, said, noting that in addition to brick and block laying, he had the remarking on the variety of the work and how quickly it captured chance to do stonework, welding, and marble work. At the encourhis attention. “We did a lot of great work around the center… agement of IMI’s former national Job Corps Director and Local some dormitory remodeling, we built signs for the Shawnee 4 IN/KY’s Business Agent, Elmore was eventually persuaded to National Forest, and because I had the talent, I got to travel to bring his talent to a new job as the Atterbury Job Corps Instructor. other centers to work on projects,” he said. In that role, he took it upon himself to learn about the policy side Elmore’s Job Corps instructor had an “old school, keep your and contractual parts of Job Corps, something that prepared him head down, work hard mentality.” Nonetheless, he encouraged to step into the role of Regional Job Corps Director, and ultiElmore’s knack for the trade. When Elmore didn’t get accepted mately, become the program’s National Director. into the union on his first try, he considered joining the military. “I couldn’t think of another job that I would love to do, However, his instructor, Lloyd Blair (one of the first graduates except this one,” he said. “And to think that I’m past half way in from IMTEF’s Instructor Certification Program), convinced my career, it’s unbelievable. Where did the time go? It’s been very Elmore otherwise. “You’re so talented,” he told Elmore, and set rewarding. I’m so happy that this organization took a chance on out to help him join a BAC apprenticeship program. me and that I’ve been able to give back to the programs that gave As the International Masonry Institute’s (IMI’s) National Job me so much throughout my career.” Corps Director, Elmore encourages his instructors to act as mentors IMI operates 37 Job Corps brick and tile training programs to students in the same way Blair did for him. “I tell my instructors at 33 centers around the nation, employing BAC instructors who that the students need a positive role model in their lives, and that it’s provide classroom and hands-on training. Funded by the U.S. their job to be that role model. Investing time in students and taking Department of Labor, Job Corps is a free program that helps eligible an interest in their future ultimately makes them more loyal to the 16-24-year-olds build careers and independence. The program offers trade and union,” Elmore said, speaking from his own experience. a viable pathway to a career in the trades. For more information on “It’s rewarding to help people,” he said, reflecting on his own IMI Job Corps programs, visit imtef.org/job-corps-program. Want to Get ACT Certified? The International Masonry Training and Education Foundation (IMTEF’s) instructors are trained to administer ACT testing. BAC members interested in pursuing ACT will be given an ACT study guide and a copy of ANSI and the TCNA handbook to help prepare for the test. To obtain certification, tile installers must successfully complete: •	a 25-question open book exam to prove knowledge of ANSI standards and TCNA-recommended installation methods; •	a hands-on assessment to prove practical skills. The exam for each certification takes 4-8 hours and requires several days of study time. ACT is offered in 7 key skill areas: •	Grouts •	Large Format Tile & Substrate Preparation •	Membranes •	Mortar (Mud) Floors •	Mortar (Mud) Walls •	Shower Receptors •	Gauged Porcelain Tile and Gauged Porcelain Tile Panels/Slabs Contact your Local training center to get more information about ACT testing opportunities in your area or visit imtef.org/advanced-certifications-tile. From left, U.S. Representative Donald Norcross (D-NJ), BAC President James Boland, U.S. Representative Bobby Scott (D-VA), and U.S. Senator Jack Reed (D-RI). Get started today by registering online now at member.bacweb.org for the BAC Member Portal by following these simple steps: •	Log onto BAC’s homepage at bacweb.org •	Have your IU Number ready (located on the upper left of your Union card) •	Have the address of your active e-mail account ready •	Click on the “Member Portal” banner •	Click on “Create an Account” •	Follow the instructions on the screen •	Sign up for the receipt of IPF/BAC SAVE materials electronically •	Record your username and password for future use Register for the BAC Member Portal and Mobile Applications and Stay Connected. Note: BAC SAVE 401(k) Plan participants have similar access to their 401(k) accounts through Wells Fargo at wellsfargo.com. et’s face it, over time the trades are hard on the body. In fact, one of the highest clinical cost drivers for the International Health Fund (IHF) is musculoskeletal conditions. In addition to being costly conditions, they are also complicated, requiring diagnostic exams such as computed tomography (CT) and magnetic resonance imaging (MRI). Going to the right provider at the right time is critical to not only ensure you receive the right care at the right time, but also to ensure you can get the best cost. In order to help our members with their spine and joint care, the IHF rolled out the BAC Cares Spine and Joint Solutions (SJS) program effective February 1, 2019. What is BAC Cares Spine and Joint Solutions? •	Explore your treatment options (surgical and nonsurgical) •	Access top facilities and doctors in our Centers of Excellence (COE) network •	Prepare for surgery, if needed •	Connect with an on-site care navigator who will help with all appointments and needs at the hospital •	Get personalized support after surgery and during recovery (up to 90 days after leaving the hospital) How much does this program cost? BAC SJS is already part of your benefits, so there’s no extra cost! In fact, enhanced benefits are offered to members who enroll in and use this program. These benefits include: •	Waived deductible •	Lower co-insurance •	Eligible travel expenses if the recipient lives more than 50 miles from a facility. How do I participate? For more information about this program or to join, please call the phone number on your health plan ID Card. You may also get a call, inviting you to join the program, so be sure to pick up the phone if UnitedHealthcare calls. Any questions, please call BAC IHF at 1-888-880-8222 or UHC at 1-866-633-2474.
co-workers, training materials, hard hat stickers, and stories of past successes visit www.stopconstructionfalls.com and the online ordering form at https:// stopconstructionfalls.com/onlineordering-form. Bureau of Labor Statistics. 2017 Census of Fatal Occupational Injuries ( final data). Industry by event or exposure, 2017. Accessed 2/11/19. https://www.bls.gov/iif/oshcfoi1.htm#2017. of trainers and apprentices from across the country, the training program has been tested and revised over the last two years to ensure it meets members’ needs and trainer requirements. Based on their input, the research team updated the delivery platform of the training, reduced the number of required classes, added other training options such as the CPWR Foundations for Safety Leadership Training, and expanded the instructor guide. The final SAVE program has already been delivered to over 100 BAC-IMI trainers, and is currently being shared and integrated into our apprenticeship training nationwide. •	A NIOSH team studying mast climber use has focused on whether various production table designs intended to eliminate the need for a step deck may reduce falls and back injuries. Thanks to the members who responded to the Partnerships request for help, the researchers were able to test bricklaying risks when performed with (1) no production table, (2) a standard table design located parallel to the wall/work area on the opposite side of the worker, and (3) a new NIOSH designed L-shaped table that enables a worker to stack materials in front of their body and perpendicular to the wall/work area – eliminating the need to reach back for materials. The study found that while both the use of the existing industrial production table and the L-shaped table would reduce back-injury and postural-sway hazards while working on a mast climbing work platform, workers using the L-shaped table had a lower risk for a back injury. Now that the lab work is done, the researchers are going to job sites to test the stability of anchored mast climbing work platform in real-world conditions. The good news is that we are making progress in addressing hazards and improving safety on masonry jobs, but safety is something we all need to focus on every day. What can you do: •	Protect your hands – keep them the “best hands in the business” by using tools that fit to prevent injuries and gloves to prevent – potentially career ending – dermatitis. Check out ChooseHandSafety.org to learn more. •	Protect your hearing. Hearing loss happens gradually and can be prevented. Use hearing protection. To learn more about hearing loss, noise hazards, and how to protect your hearing check out this Hazard Alert from CPWR (Noise and Hearing Loss - https://www.cpwr.com/sites/default/ files/publications/Noise-Hazard-Alert.pdf). •	Do not let silica take your breath away – use water or a vacuum and know who your employer has assigned to make sure controls are being used and working properly (the competent person). Remember, protecting you from exposure to dangerous levels of silica dust is the law. Visit the website Work Safely with Silica (www.silica-safe .org) to learn more. Life Insurance • Whole Life Insurance • Discount Dental Plan • Hospital Expense Protection • Accidental Death and Dismemberment (AD&D) The Union Labor Life Insurance Company understands the labor movement and its members. As workplace insurance plans change, workers may want to address gaps in existing benefits with additional coverage. The reality is that we can all help to prevent suicide. The first step involves becoming more familiar with warning signs of suicide. The second is to take action when someone shares thoughts about suicide. The caveat, better safe than sorry, is most apt when it comes to suicide prevention. It is critical to take any statements about wanting to die seriously! When in doubt, friends, family members, co-workers, and job supervisors should call the Suicide Prevention Lifeline for advice, or contact the BAC Member Assistance Program (MAP). Simply allowing depressed people to start a conversation about their suicidal thoughts helps them feel less alone. It’s important to listen attentively without interrupting or rushing to judgment. Express caring and concern, and reassure the person that help is available. Remove weapons and other means of easy access to suicide from the person’s home, and don’t leave him or her alone. Finally, it is important to encourage and assist the person to speak to a mental health professional so that he or she can be properly evaluated and referred to treatment. And, while many people are worried about being open and honest about their suicidal thoughts for fear of being committed to an inpatient mental health hospital – the truth is that the clear majority enter treatment voluntarily and at a level of care appropriate to their needs, such as an outpatient mental health clinic. If you or someone you know is suffering from depression and suicidal thoughts, help is readily available. The BAC Member Assistance Program (MAP) provides confidential, professional help to union members and their families at no charge. All calls are strictly confidential. BAC MAP staff will not talk to anyone, including local union leaders, about your private concerns. Give MAP a call today at toll-free: 1-888880-8222. MAP is generally open from 8 a.m. to 8 p.m. Eastern Time, Monday through Friday. Just ask for MAP. On the job, BAC members give their all to sustain BAC’s proud traditions of craft, skill, and productivity, or to coin our slogan, by excelling as “the best hands in the business.” Off the job, members bring the same enthusiasm to their varied hobbies and sporting pursuits, as illustrated in this year’s “Sporting Life.” If you or your family would like to be featured in the next “Sporting Life,” please send your photos to: BAC Journal, 620 F Street, NW, Washington, D.C. 20004 or email them to askbac@bacweb.org. d Rocca, a 90-year-old retired member of Local 8 Illinois, was preparing for his second Tour De Donut bike race in Alton Illinois on July 7th. Last year Brother Rocca finished 716th out of 1250 riders and 12th in the age category of 70 and over in this 36-mile race. Brother Rocca started riding bikes at the age 80. Has over 44,000 miles on his odometer and rides 3-4 days a week. When not riding, he enjoys reading and keeps a log of books read by author. To date he has read more than 600 books. BAC Local 1 PA/DE member John Cuccurullo harvested this 8-point buck in Maryalnd with a Thompson center muzzle loader. Local 4 California Field Representative Jon Coulson, pictured with his sons, caught this 427-pound yellow fin tuna in the Sea of Cortez. The catch was recorded as top 3 in the world taken on rod and reel. BAC Local 1 Newfoundland member David Cox with his catch of the day, a 27-inch, 5.5-pound English brown trout caught at Snowâ&#x20AC;&#x2122;s Pond in North River, Newfoundland, Canada. BAC Local 5 PA retired 41-year member Bruce Gloss caught this 7-point moose in Newfoundland. WHERE UNIONS MEET THE OUTDOORS! The Union Sportsmen’s Alliance (USA) unites union members who share a love of the great outdoors and a commitment to help preserve North America’s outdoor heritage. USA members WORK hard and PLAY hard, and the USA serves their passion with clay shoots, dinners, a union-dedicated TV series, community-based conservation projects and many great benefits. • Chances to win prizes and trips all year • Opportunity to participate in USA conservation projects and events • Chance to apply to be a guest on the USA’s outdoor TV series YOU DESERVE AN OUTDOOR ORGANIZATION TO CALL YOUR OWN. ACTIVE AND RETIRED BAC MEMBERS CAN ACTIVATE A NO-COST USA MEMBERSHIP, AS A BENEFIT PROVIDED BY THE BAC. e 21 février dernier, les Syndicats des métiers de la construction du Canada (SMCC) ont annoncé l’ouverture de trois bureaux du programme OAWA (Offices to Advance Women Apprentices) : au Manitoba, en Saskatchewan et en Nouvelle-Écosse. Ce programme a obtenu un financement de plus de 3,1 millions $ pour soutenir les femmes apprenties au cours des trois prochaines années. Au moins 750 femmes apprenties devraient en tirer profit, notamment dans les communautés autochtones. From left, BAC Local 9 PA President Norman Ringer, Jr. presents Gold Cards to 50-year members Giuseppe Gulli and Dominick Mariani. Frank Decker, right, receives his 25-year service award from Local 4 IN/KY Field Representative Steve Knowles. From left, Director of Wisconsin District Council (WI DC) Gary Burns, Gold Card member John Partoll, retired Director of WI DC Jeff Leckwee, and 40-year member Michael Brock, Jr. Standing from left, David Broeringmeyer, Matt Braun, President David Toenjes, Pete Spence, Devin Coulter, Clay Wilson, Tj Dittamore, Tim Wilson, Kyle Allison, Ron Shamhart, Rex Borries, 40-year member Mike Borries, Shane Garrisson, Kieth Lamb, and Ryan Dittamore; Sitting from left, retired Field Representative John Moore, 50-year member Allen Wente, Tom Mcginnis, Bret Fuson, Bill Tighe, and Keith McClellan. Gold Card member Thomas Fortier, right, receives his service award from Local 8 SecretaryTreasurer Pete Spence. Front row from left, Jim Fortner, Marvin Zorn, John Leach, Ray Strawkas, and Scott Tinkham; second row from left, Rob Loyd, John Wilson, Zak Landers, Brett Seward, Joseph Hildebrand, and John Lutzow; third row from left, Travis Rider, Shane Garrisson, Vaughn Renfro, Jason Atwood, Marc Landers, and Joseph Lowder. Fifty-year member Gary Thurman, right, receives his Gold Card from Local 8 Secretary-Treasurer Pete Spence. From left, 40-year members David Schaeffer and Keith Rickert, 25-year member Reginald Davis, 40-year member Kevin Veath, and Local 8 IL President David Toenjes, who also received his 40-year service award. Gold Card members James Crockett, left, and Steve Morthole. From left, 40-year member James Nash, Saint John Chapter Chair and Vice Chair Joe Pascon, 50-year member Adelio Gradim, 35-year member Joe Mattina on behalf of his father Carmelo Mattina receiving a Gold Card, Vice Chair Rejean Goguen, 40-year member Hermel Theriault, Vice Chair Denny Vautour, and 50-year member Battista Rocca. ď °F  rom left, 50-year member Sifroi Melanson, Moncton Chapter Chair Terry Gautreau, 50-year member Leo Allain, Local 8 NB President Gerald Reinders, 50-year member Roger Bourgeois, Vice Chair Fred Vautour, Vice Chair Rejean Goguen, 50-year member Leandre Leblanc, and 40-year member James Nash. ď ´F  rom left, 40-year member Edmond Vautour and his granddaughter Marissa, and Vice Chair Denny Vautour. Local 5 Oklahoma/ Arkansas/Texas/ New Mexico Local 5 OK/AR/TX/NM Gold Card member Arnold Davis Sr., left, and BAC South Regional Director Ed Navarro who also received his 40-year service award. Seated from left, 50-year members Michele Novelli, Robert Mottolo, John Miller, Edmund Henry, Angelo Colasante, Ronald Chisholm, Daniel Brady, and Michael Barie Sr. Standing from left, Local 3 MA/ME/NH/RI Vice President Jim Dailey, IU Secretary-Treasurer Tim Driscoll, 50-year members Antonio Sambucci, Robert Souza, and Robert Taylor, Local 3 MA/ME/NH/RI President Chuck Raso, 50-year members Antonio Tramontozzi and George Weymouth Jr., Chapter Chairman Tony Antonuccio, and Local 3 MA/ME/NH/RI Executive Vice President Chuck Raso Jr. Seated from left, 25-year members James Perkins, Patrick Mannion, Paul Hardie, Joseph Ciraolo, Peter Bobillier, and 40-year member Paul Magny. Standing from left, Local 3 MA/ME/NH/RI Vice President Jim Dailey, Executive Vice President Chuck Raso Jr., President Chuck Raso, IU Secretary-Treasurer Tim Driscoll, and Chapter Chair Tony Antonuccio who also received his 25-year service award. of Training and Apprenticeship Training Director Bob Arnold. “I had the pleasure of working with Frank in the 1980s and then met up again at the National Training Center. Hundreds of BAC members attended our refractory course under the instruction of Frank Koletar. He was a mentor to many and a gentleman to all.” Brother Koletar was also an active volunteer with both the North County Habitat for Humanity in Chautauqua County, NY and the Pasco County Habitat for Humanity in Florida. Brother Koletar often recruited volunteers from Local 3 New York to assist in masonry construction and personally logged over 650 volunteer hours in the Silver Creek area alone. The North County Habitat for Humanity plan to honor Brother Koletar by naming their most recent project the “Frank Koletar House” and noted that “he will be missed for his love to teach, help, listen, problem solve and provide a helping hand whenever needed.” Brother Koletar is survived by his wife Joanna (nee Sikora) Koletar; daughters Lynne Marie (Ed) Kowalski, Dawn Friend, Lisa Diebold, and Melissa (Scott) Duquin, son David (Cat) Koletar, six grandchildren, three great-grandchildren, and his close BAC Brothers Sugg and Isadore “Izzy” Rapasadi. training courses in glass fiber reinforced concrete, welding, pointing-caulkingcleaning and other restoration specialties. In addition to working in the field, he held positions as Wisconsin State Organizer, Executive Board Trustee of Local 8 Wisconsin, Recording Secretary for Milwaukee Area Labor Council, Member of the Local Black Trade Unionists. An activist and fighter for workers’ rights, he testified in public hearings at the Department of Labor and before the House of Representatives’ Subcommittee on Workforce Protections on silica dust, which contributed the issuance of a final rule on OSHA’s Silica Standard. He was also active with WRTP/Big Step as an MC3 instructor and a great mentor for Local 8 WI apprentices. Most of all, he was a great father to his 8-year-old daughter Kai. IU Death Benefit Claims must be filed within one year of the member’s death.